Time to crack open another vintage colouring book and see the madness inside! 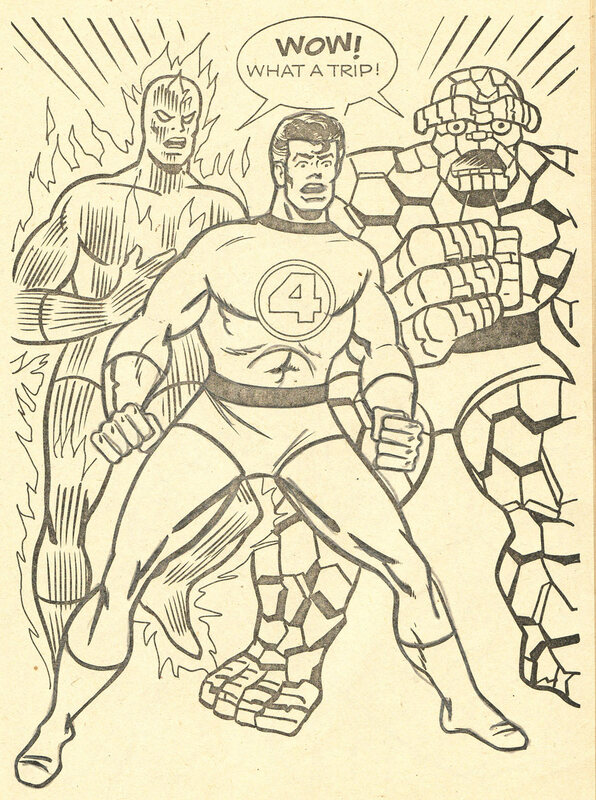 Fantastic Four was one of my favourite comic books as a kid, the treasury editions quickly imprinted on my young brain and I was a fan for life. 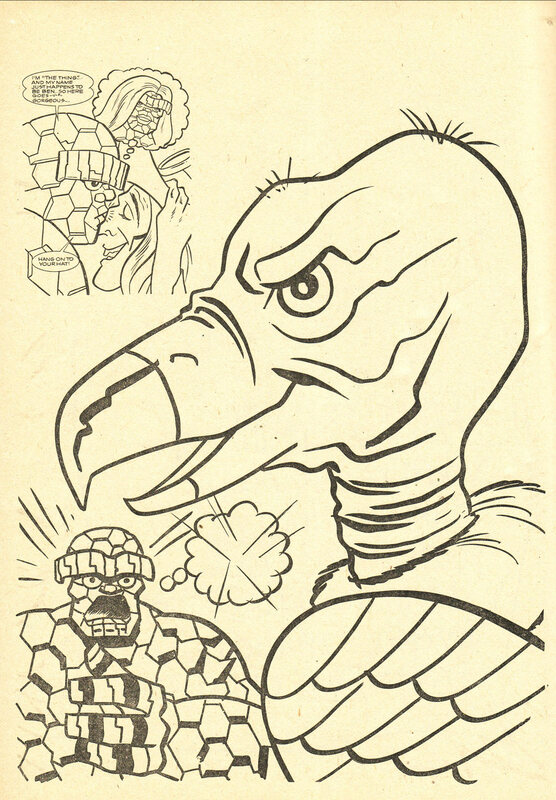 My last take on a Fantastic Four colouring book was well, disenfranchising, so hopefully, this one is a little better. 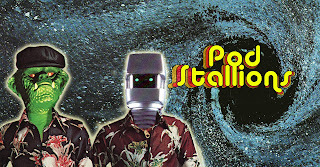 At least this one has Johnny and not Herbie the %$#^ing robot. I already love the cover artwork with the three male heroes battling the titular Witch while Sue makes jazz hands. Check it out after the jump and when you're done, check out this other book from the series. So the story begins with a UFO and the US military launching a missile at it. 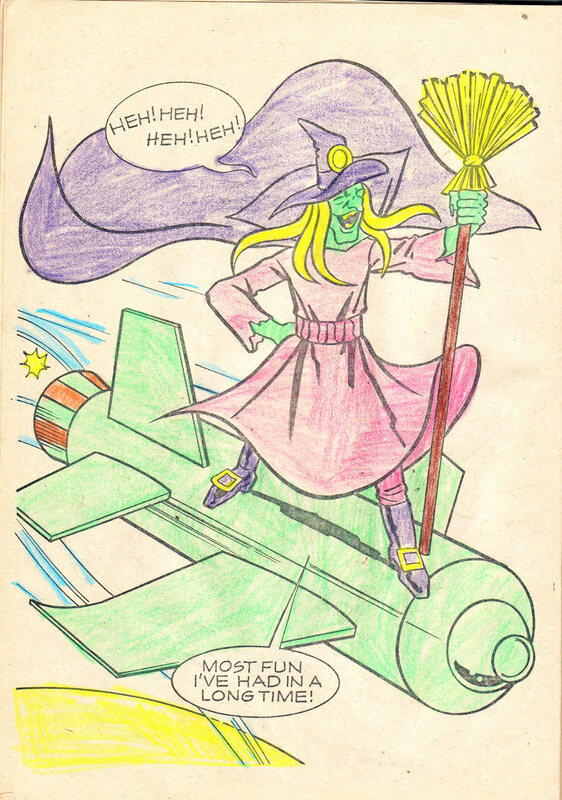 Turns out it's a witch, I love how this kid coloured her green. 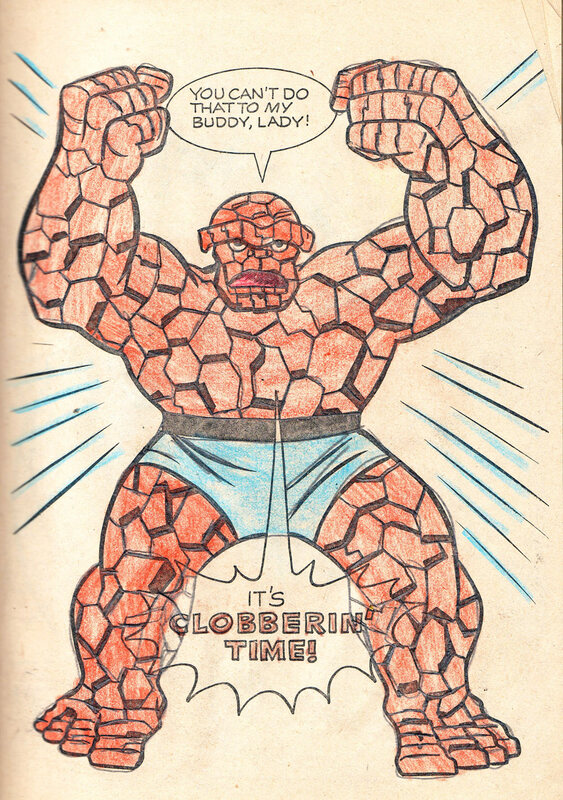 The Fantastic Four comes to the rescue and even the Thing questions the story by breaking the fourth wall. I just want to point out that the art is kind of nice. This is a swipe from Kirby but it's well done. The Witch turns Reed, Johnny and Ben into various animals and sends them off into space because...Witch! Seriously there is a page with a toad, a turtle and a firefly floating in the vacuum of space. I guess they're dead? 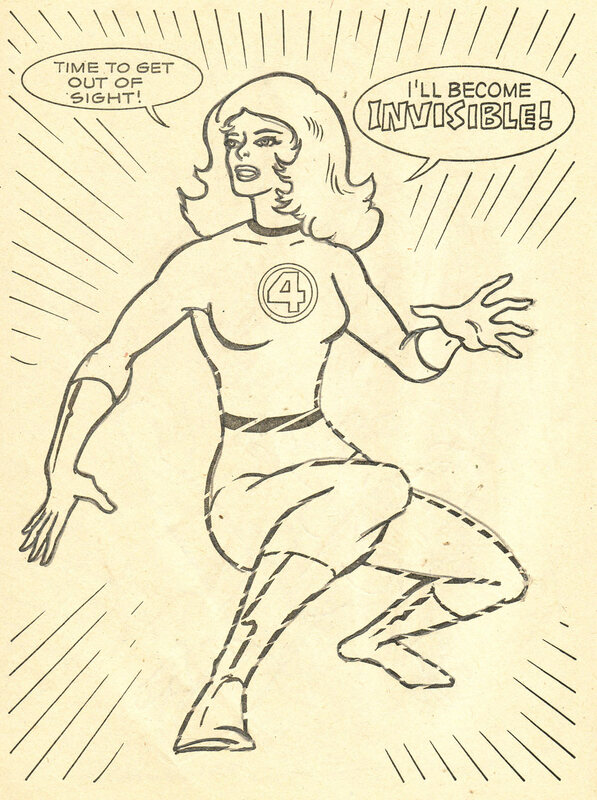 Only Sue survives by using her powers, I don't know if you should loudly announce turning invisible. 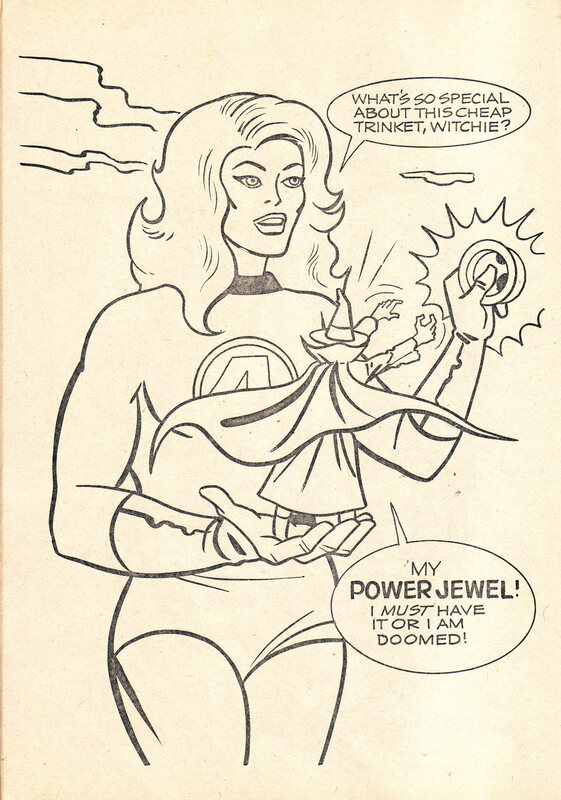 Sue removes the Witch's Power Jewell and she shrinks down. I hesitated to post this photo because I just know it's someone's fetish. 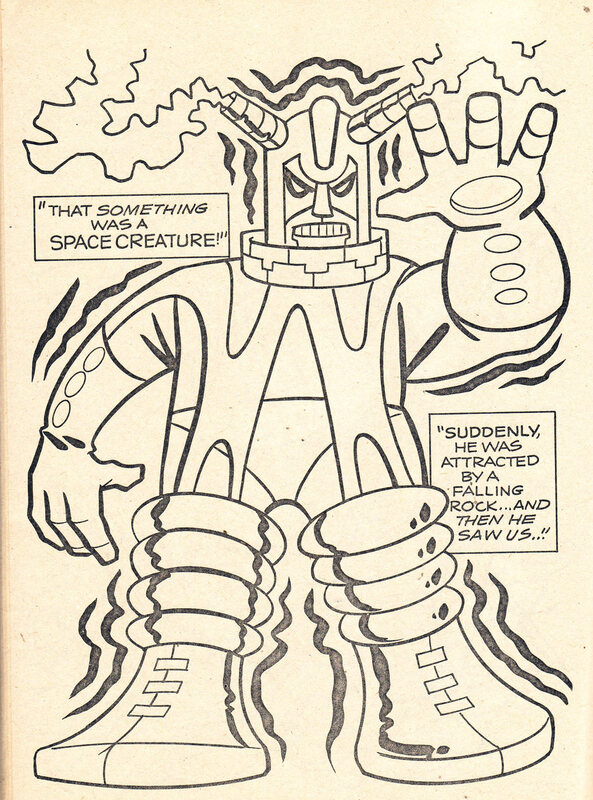 The Witch returns the lads from outer space and they utter the kind of dialogue you expect from the World's greatest comic magazine. The story takes an even weirder turn when the Witch apologizes and explains her origin, she mentions that she was once beautiful and well, this happens. 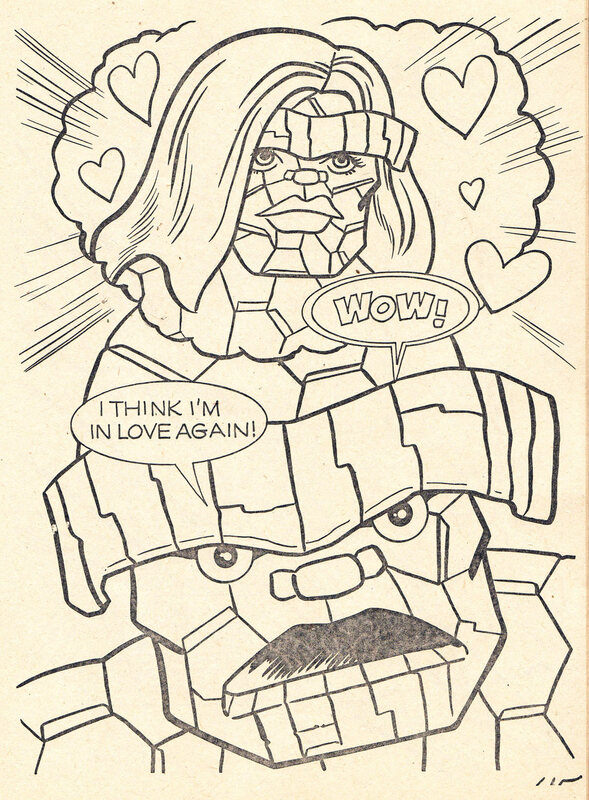 I don't want any more looks into Ben Grimm's brain thank you. The Witch explains that some sort of alien evolved her into a Witch, which I'm pretty sure was an issue of "The Eternals". A piece of paper falls from the Witch and Sue discovers that the only way to break the "Space Creature's Curse" is a kiss from The Thing. So is this some sort of space gypsy? For some weird reason, the page with Ben kissing the Witch is an insert in the final page, did they have too many pages? Were they timid about showing a kiss? THIS IS GOING TO BUG ME! 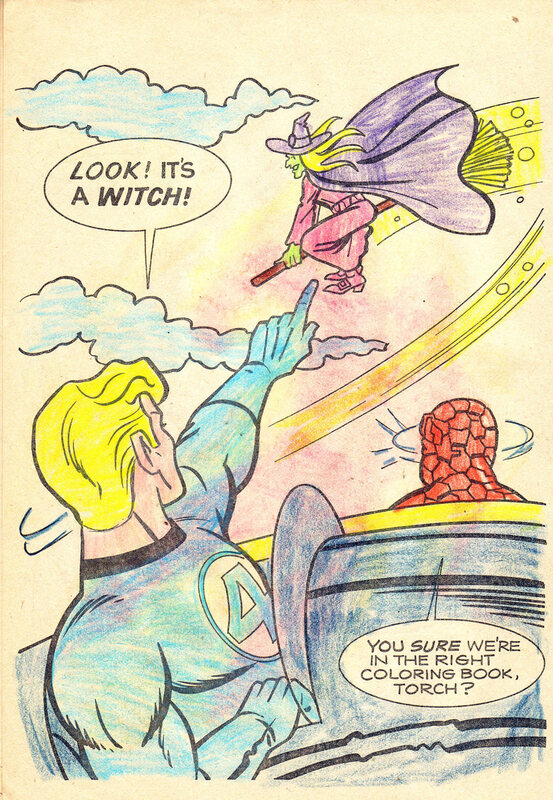 Anyway, now the Witch is a buzzard and reunited with her and the Fantastic Four waves goodbye like idiots. Why did an alien curse a bird? We'll never know and I don't care, that's a lie, this is going to haunt me. Check out our Youtube Channel videos like this! LOL!!!! Best coloring book ever! Love Thing's expressions. Still, that witch was no Pink Fink. Brian, I don't know how you do it. But you keep finding items from my childhood that I had, that I completely forgot about! 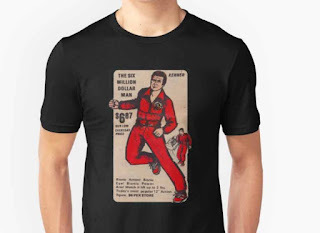 After about two seconds of staring at that picture I blurted out, " I had that!" My boss across the room looked up and gave me a funny look. Of course he was busy looking up youtube videos anyway. (it's what we do while waiting for our therapy patients to arrive.) Anyway, thank you again for the trip down forgotten memory lane. 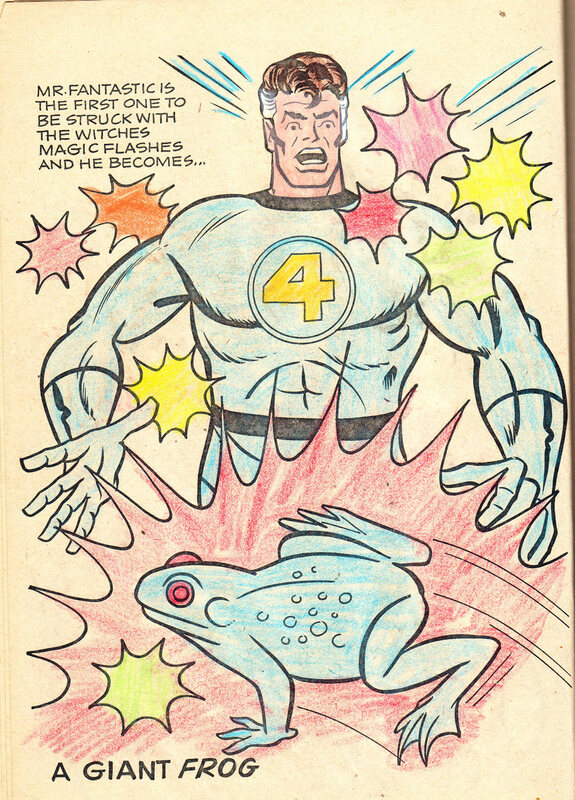 I remember only coloring Human Torch and the Witch in mine, the rest was too boring! Thanks again for your decade of dedication, I've been an avid follower since the beginning.